PERFECT START . . . Derry City defender, Conor McDermott turns to celebrate his first senior goal for the club after putting the club ahead against Drogheda United at Maginn Park on Friday night. 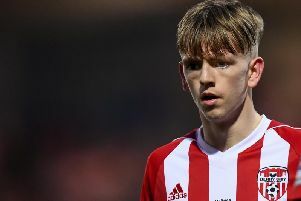 DERRY CITY defender, Conor McDermott is set to miss out on Northern Ireland U21 duty after sustaining an injury in the club's victory over Drogheda United on Friday night. The 19 year-old, who netted the first of two goals on the night and set up the second for Ronan Curtis, was replaced at half-time after failing to shake off a knock. McDermott was due to link up with the N. Ireland U21 squad next week as they warm up for a 2019 European Championship qualifier with Estonia with a challenge match away to Jersey on Wednesday next. However, City boss, Kenny Shiels confirmed the injury will rule him out of the international fixture. "We don't know how he is yet," said Shiels immediately after the match, "It's an impact injury. He's gone for an x-ray. He's a key player for us and you can see we were getting some success there in the first half when Conor was on the pitch. "I don't think there's a fracture there but he's going to miss his international trip." McDermott's goal on Friday night was his first official senior strike for the Candy Stripes although he'll certainly claim it was his second after his deflected strike earned the side a 1-1 draw against Sligo Rovers at the Showgrounds last April. Deployed at right wingback, the teenager was instrumental in the first half. He reacted swiftly to intercept Drogheda defender, Conor Kane's poor back-pass and showed tremendous composure to round the keeper and slot into the empty net after just three minutes. McDermott provided a key outlet on the right flank for Derry and he was heavily involved in the club's second goal. A quick counter attack saw Barry McNamee find Rory Patterson and when the striker spread the play to McDermott on the right, he powered forward and delivered a pinpoint cross to Curtis who finished into the net on 13 minutes. Following a robust tackle from Drogheda's Kane not long before the interval where McDermott courageously won a corner, he appeared to pick up the knock which will rule him out of international duty next week which will come as a huge blow to the player. Although he'll no doubt be determined to return to full fitness as soon as possible and join up with the squad as he seeks to receive his fourth cap for the U21s. His teammate, Ben Doherty, who also impressed on the night, was also named in Ian Baraclough's squad which take the Estonians at Mourneview Park on Tuesday, October 10th in the European U21 Championship Group Two clash.